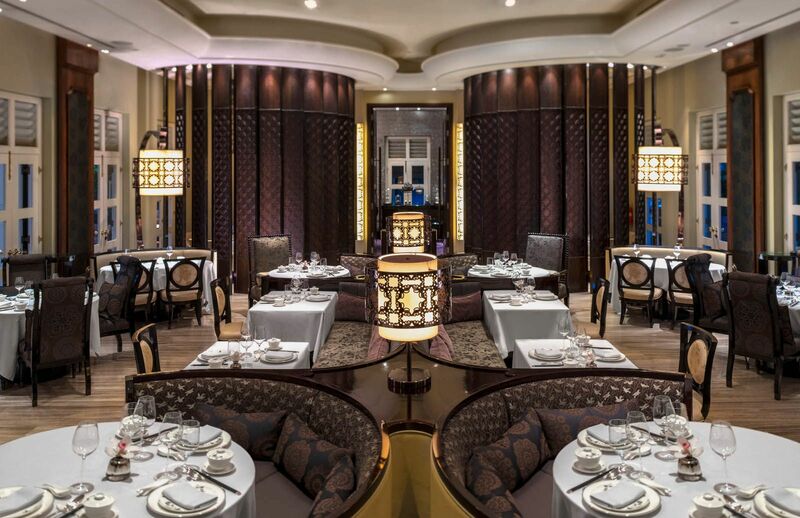 Situated within the charming Capella and designed by André Fu, Cassia is easily one of the most elegant Chinese restaurants in Singapore. Plush fabrics and opulent wallpaper are juxtaposed against the white-panelled doors of the colonial-era building, presenting a sophisticated backdrop for the cooking of chef Lee Hui Ngai. Given the tourist-centric location, chef Lee’s menu features Cantonese classics (such as five-spice roasted pork belly) that will satisfy the most traditional of palates, as well as more inventive locally inspired dishes such as deep- fried salted egg yolk softshell crab, which travellers are unlikely to find outside of Singapore. Unlike other larger-scale Chinese restaurants on the mainland, Cassia’s intimate size and its low table-to-staff ratio (with the staff led by long-time manager Bryan Pong) provides for a dining experience not commonly found anywhere else. The Oriental Dim Sum Afternoon Tea (only available from 3pm to 5pm on weekends and public holidays) is another way to enjoy more time in the blissful environs.